First off, what the levels mean! The tweet I posted listed 1000 ppm as an "acceptable" maximum, and 1400 ppm as "impaired decision making". The 1000 ppm comes from a recommendation of a heating/aircon organisation (ASHRAE), but it seems that was a maximum for comfort and is not in their later specifications at all. 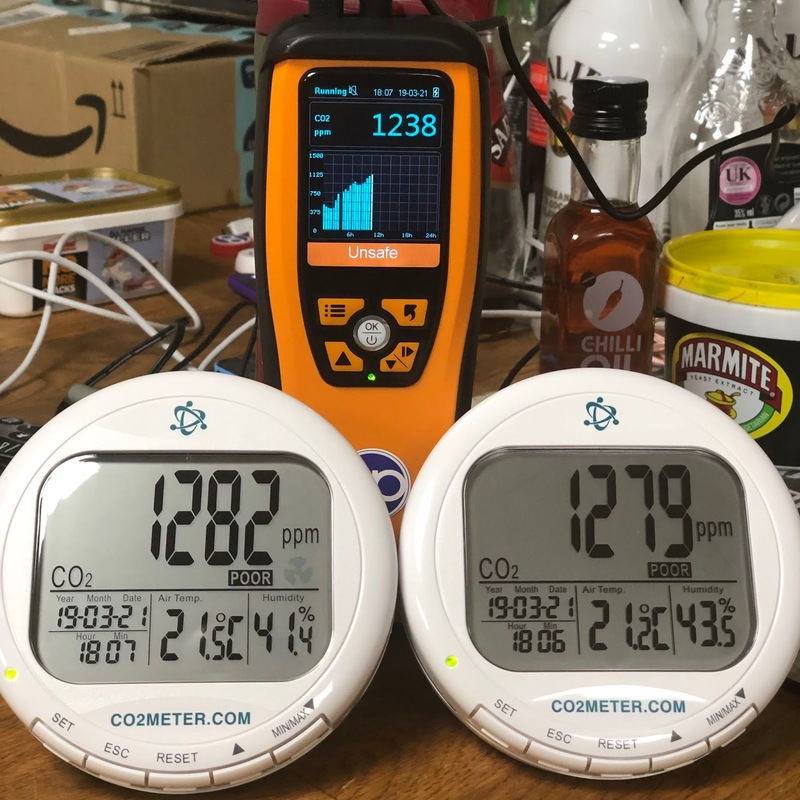 There are other places that talk of 1000 ppm as a target for comfort, and that 600 ppm over the outside level is an "acceptable" maximum (outside typically 400 ppm). I don't understand why the reference to outside matters - one comment is we get acclimatised, but if that is the case then my spending all my time inside (well I used to) would acclimatise me to a much higher level. Interestingly, the hand-held meter I have has a "calibration zero" feature which involves it being outside for half an hour but what it does is set that as 400 ppm exactly. This makes no sense to me, as calibration needs a known reference and I have measured outside from 430 ppm to 560 ppm at different times and places, so not a reliable reference. 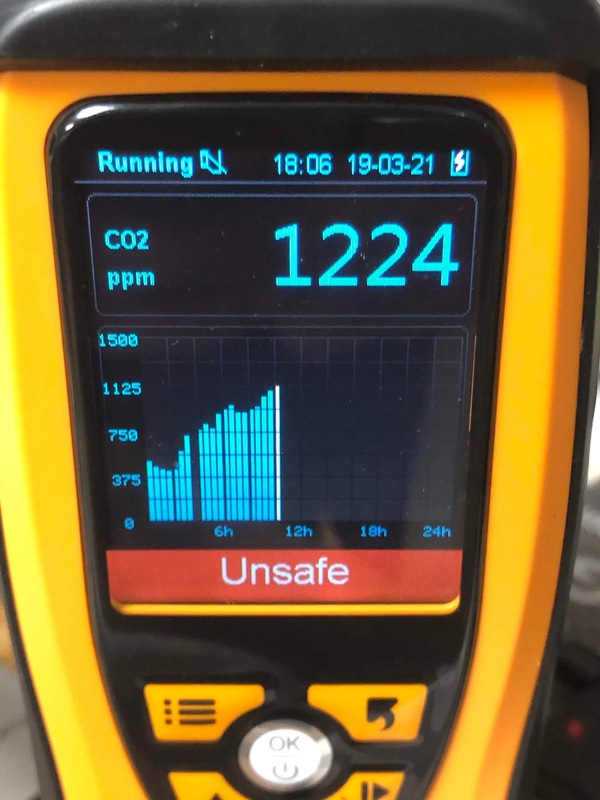 Whilst 1000 ppm may just be for "comfort", I see no reason that I (or my staff) should not be comfortable, and indeed with the prospect of higher levels causing tiredness and impaired judgement, it seems like a perfectly sane target for me to use. Interestingly it has an automatic baseline calibration that sets 400 ppm as the lowest it sees over the last week. I don't understand why the meter is not accurate rather than relying on measuring my local outside CO₂ levels! The two meters are pretty consistent, but a bit higher than the hand-held meter - none have been "calibrated" though. This is what really fooled me. I expected that levels would reach an equilibrium with people breathing and air flow to/from the room quite quickly, so one could measure and see what say "one person working in this 5m x 5m room" gets to. I was wrong. It my home office today the level started shortly after 9am at 430 ppm, but with just me in here (even coming and going a bit) the level has steadily increased throughout the day reaching 1000 shortly after 2pm. It kept going! It has dips when I was out of office for a walk, and when the outside door was open for a while for a delivery, etc, but it has shown no sign of stopping yet! This means, for example, when I checked the office and saw 1200, that could have been the result of a reasonably ventilated office with a lot of people and be like that all day, or could just be where it has got to in a poorly ventilated room at that time of day (getting way higher as the day goes on). I'll have to do a trace for the whole day to know. What I have concluded is my office at home needs some validation. The small vents over the windows (with windows closed) are clearly not enough. My plan is getting some whole day graphs before and after to confirm how well it works, and I'll post more details. The same is true for my bedroom - not wanting a window open to fight the air-con. I saw that the levels similarly just keep going up when in there awake. Once asleep they do slowly go down, but that was tested with only one person in the room. I'll post more once I have more data and comparison with the fans installed. P.S. Nice thing about my man-cave is it has two doors - open both for a minute and you remove all the excess CO₂ and back down below 500 ppm ready to start again. Is your orange meter really saying that 1224ppm is "unsafe"? Or is it complaining about something else? The effects of C02 are cumulative so you can tolerate higher levels for a short period and lower levels for longer. Short-term exposure limit (15 minute reference period) of 15000 ppm. Some people can tolerate more than others and tolerence levels rise with comtinued exposure. Smokers can generally tolerate higher levels due to their constant exposure for the CO2 in the cigarette smoke. Indeed, but there are also levels for "comfort" and "impaired decision making" well below actually being unsafe, one assumes. I have some experience of these sort of sensors although the O2 variety from scuba diving. The sensor modules have a chemical reaction with the gas being measured. Did your instruments come in a sealed bag of some sorts? They measure the gas partial pressure (amount of gas modules) so are affected by air pressure. The sensors do age. Over time they become less sensitive and eventually become unable to read higher values. This is more significant with scuba diving as you are measuring very high percentages of Oxygen so probably insignificant for measuring CO2. However it does mean any factory calibration will drift with age. Maybe the way they do it with your meters is designed for a lower cost unit and avoids it having to be sent off periodontally to be recalibrated. The kind of CO2 sensors RevK is using here use NDIR rather than a chemical reaction (i.e. it's a physical property of the gas they're measuring, not a chemical one). Obviously there are drift, etc, issues, but not the kind of chemical problems some other kinds of gas sensors have. We live in a Victorian house and as we "plug" all natural ventilation (snug fitting floorboards / double glazing etc) we started moulds on skirting boards etc due to reduced ventilation to a point that we seriously considered moving out to a new built property. As a last resort I came across a simple device called Positive Input Ventilator (search amazon for PIV) - which works by pumping the dry air in the loft space back into the property which seem to work and all our high humidity and ventilation issues resolved. Obviously, it doesn't come close to opening windows on a spring day but it is the next best thing. Try EnviroVent for PIV devices. I am in the property investment/management industry and these are not cheap but they seem to deliver results, especicially when tenants claim that their propensity to hang dripping wet clothes over radiators is absolutely NOT the cause of damp/mould in the property. I'm not convinced that CO2 concentrations even several times atmospheric is an issue. The effective partial pressure in blood is over 50k ppm and in the lungs is around 45k ppm (see 'Pulmonary gas pressures' in Wikipedia). Also the body is quite good at homeostasis, so if the partial pressure in blood goes up, you will just breathe a bit deeper and a bit faster to stabilise it. The lowered concentration of oxygen in a closed room is more likely to affect mental state - the body doesn't react to counter lowered oxygen levels, as tests on pilots in reduced air pressure have shown.